First Blog Anniversary Celebration Event with Giveaway!!! I am so happy to be blogging by god's blessing and meet amazing people in this one year of my blogging journey. I am so thankful to my husband and my mom who have given me the full support and strength to go on and on. I am so grateful to the wonderful people I met through this virtual world. More than my personal experience and growth, I am glad and happy to have learned a lot from you all. I truly enjoy learning new recipes, the food styling, presentation and the story each recipe carries from every blog. I have been waiting for a long time to celebrate blog's first anniversary and excited to celebrate with a small event!!! This summer I am sure most of you would have planned for zillion recipes to celebrate with family and readers. You could share yours here for the First Anniversary Giveaway Event and be eligible to win a prize!!! I have a giveaway too, so let's check that out before the rules to be followed for the event. First Prize: The person who has followed the rules and has linked the most number of entries. For those outside India, its an amazon $20 gift card. Second Prize: If the number of entries for the event crosses 100, then the person with the second highest number of entries is eligible for the second prize. For those outside India, its an amazon $10 gift card. Third Prize: If the number of entries for the event crosses 200, then the person with the third highest number of entries is eligible for the third prize.For those outside India, its an amazon $5 gift card. The event runs from April 15th to May 17th 2015. Recipe can be of any cuisine, course, veg or non veg. Any number of new recipes and a maximum of 8 archived recipes can be linked. Usage of logo and event link is mandatory on new and archived recipes. Archived recipes must be updated with the event logo and link. 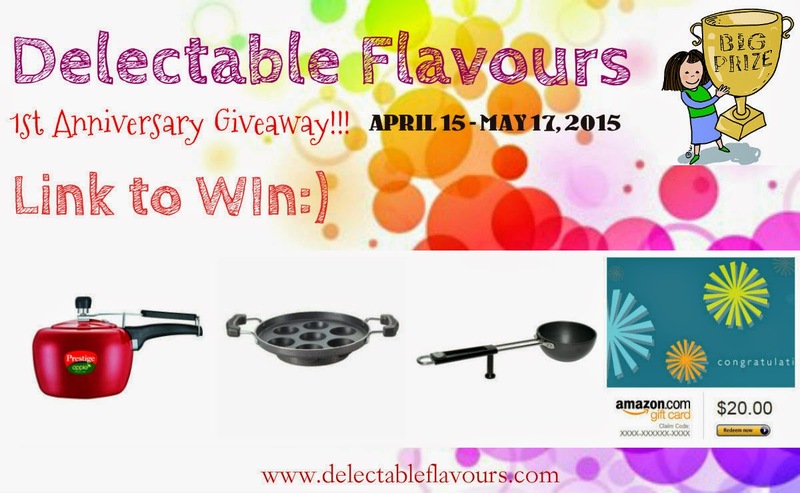 Link your recipes back to this announcement page "Delectable Flavours Giveaway Event". Use the linky tool below to link the recipes. It is mandatory to become a member on my blog page through Google Friend Connect, Subscribe to my mailing list, like my Facebook Page, Follow on Twitter and Pinterest. Leave a comment below of the mail id used to subscribe and connect in GFC, account names of pinterest and twitter. For Non-Bloggers, you can send your recipes with a picture and detailed instruction to my mail id: delectableflavours@gmail.com. The winners will be announced in the page on May 22nd'2015 - The blog's First Anniversary. If you have any queries, shoot me an email to delectableflavours@gmail.com and I will be happy to help. Hi malathi. The link became active from today so check now, it's available. Congrats dear ..I have already linked few....Happy Hosting dear.. Already following you on Pinterest ,Fb and GFC. Congratulations on completing one year dear! And what a lovely way to celebrate! Wishing you loads of success in the coming years! Happy hosting, will link in my entries soon! Congrats Ree ,linked few recipes ,following u on fb, gfc,pinterest ,mail subscription. Thanks Monu...You must link back to the event and have followed the rules. Those who have linked the maximum no of entries win!!! Great event Ree.. All the very best in this blogging world.. am adding my recipe..
Congrats Ree..wishing you many more blog anniversaries,lovely event too..Happy Hosting!! Congratulations on your blog Anniversary, Happy hosting. Happy anniversary dear. Will link my entries soon Insha Allah. congrats dear.. will link my entries soon.. I am new here and like to link my entries, will you guide me please. Thank you! Dear mail me at delectableflavours@gmail.com so I could guide on how to link! Done with the rules sooriya.Linked few of my entries. Congrats .. I will send in my entry as well. Getting this far is awesome. I know it takes effort and time to cook and then write about it. Job well done and kudos to your passion.